The Department of Psychology is a very prominent department at the University of Miami. Psychology is one of the most popular undergraduate majors and is also the largest Ph.D. granting department at the university. The department has 43 full time faculty, plus secondary appointments for faculty whose primary appointments are in other departments, including Biomedical Engineering, Epidemiology, Medicine, Neurology, Pediatrics, Psychiatry, and Public Health. The faculty teach courses, conduct and supervise research, and serve on thesis and dissertation committees. The faculty (and their graduate students) are very productive, publishing approximately 100 journal articles, chapters, and books per year. They also present at national and international professional conferences and by invitation at other universities. The faculty currently obtain over $17 million per year in external funding in support of research activities of various kinds. Most of the Department’s teaching and research activities are housed in the Flipse Building. 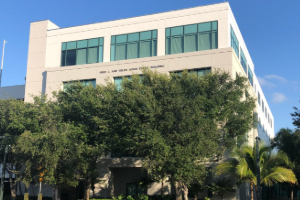 However, there are behavioral, quantitative, and other laboratories in the Behavioral Medicine Research Building, also on the Coral Gables campus and in the Clinical Research Building on the medical campus. A Neuroscience Annex also recently opened, which houses an fMRI scanner dedicated to neuroscience research. Typically about 75 graduate students (80% women; 30% minorities) from all areas of the United States and several foreign countries are in residence at any one time, with an additional 15 to 20 on internship. All graduate students are fully funded. All doctoral programs strongly emphasize research while providing training in the various subfields. Only students pursuing the Ph.D. are admitted to the graduate programs. The one exception is a new master's program in Applied Behavior Analysis. The Department is currently organized into four main graduate Divisions: Adult, Cognitive and Behavioral Neuroscience, Child, and Health. The Adult Division houses the adult clinical psychology track, and the evolution and human behavior program. The Child Division houses two clinical tracks (child/family clinical and pediatric health) as well as a non-clinical program in developmental psychology. The Cognitive and Behavioral Neuroscience Division houses the non-clinical program in that area. The Health Division houses the health clinical track and the behavioral medicine track. The clinical program extends across three Divisions (Adult, Child, or Health). Click here for more information on the graduate programs. In addition to the divisional organization, the Department houses additional centers. These include the Psychological Services Center, a training clinic providing assessment, evaluation, and therapy services to the community. The Center for Autism and Related Disabilities services over 12,000 families of children with autism-spectrum disorder. The Linda Ray Intervention Center is a University-based Multidisciplinary Educational Services Center within the Florida Department of Education’s Florida Diagnostic and Learning Resources System. Additionally, the LRIC is one of the five Early Intervention Birth-Two Programs in Miami within the state’s Early Steps program for young children with disabilities. The department values cultural and individual diversity, including diversity with respect to age, color, disability, ethnicity, gender, gender identity, language, national origin, race, religion, culture, sexual orientation, and socioeconomic status. This appreciation for diversity applies to policies for recruitment, retention and development of faculty and students, and in curriculum and field placements. Issues of diversity are integrated into coursework, practicum, and research activities. In fact, the greater Miami area is one of the most ethnically- and culturally-diverse metropolitan areas in the country. Through placements at program-approved practicum sites, all clinical students develop skills working with ethnically- and socioeconomically-diverse clinical populations. In their research activities, nearly all of our clinical students work at some time or other with poor, ethnic minority, disabled, and/or gay populations.